The Spectacled Avenger has his moments of misanthropy. Sometimes it is difficult to look upon this human comedy and call it good. In my lighter moments, I can at least view it all as a sort of vast carnival of rutting monkeys — very undignified, but undeniably funny. At other times that lighter side of things is much harder to see. A typical occurrence of the latter happened the other evening on a crowded subway train, as I watched a repulsive little rat-man of dubious moral and genetic quality aggressively elbow a very pregnant woman out of his way in order to beat her to a vacant seat. This low specimen of humanity caused me to wonder how it is that “eugenics” ever became a dirty word. At such times I cannot help but entertain the notion that a little thinning of the social herd might do little harm and much good. It sometimes seems as if the vile and baseborn are crowding out the more noble exemplars of our species. 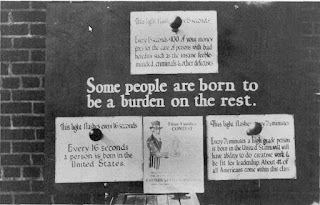 You see, when I’m in my misanthropic mood, when the human comedy seems more like tragedy, I am more prone than usual to reflect on eugenics with indulgence. Speaking of thinning the herd, consider this story, perhaps a sign of the times, recounted to me by someone whom we had over for dinner last week. She told us of a couple who are of her acquaintance, and who recently made an appeal over Facebook for their friends to contribute to a fund to help them pay for their fertility treatments. No doubt they are possessed of very superior genes and wish very much to grace the world with their continuance, believing furthermore that you and I ought to be willing to pay to ensure that they are passed on. Of these would-be philanthropists to humanity, I cannot help but think the following: First, if they cannot afford their own fertility treatments, perhaps they cannot comfortably afford to support a child either. Second, adoption might be cheaper and might do more for the common good. Third, if they are unable to see the utter tastelessness of their financial appeal, then I humbly submit that the quality of our species would likely be the better for their not reproducing themselves. This story is an example of that human comedy — of the rutting monkeys variety — I spoke of. But in such farce lie the seeds of deeper pathos, which becomes evident when we reflect upon the following paradox: much as Plato said that the ideal ruler would be the man who had no desire to be ruler, I am led to think that perhaps the ideal people to continue our species are precisely those who least value doing so. This paradox, from a God’s eye point of view is doubtless very humorous, but from an intelligent human’s viewpoint it is tragic. For what does one see all around one, but the spectacle of the lowest specimens of our genetic and moral stock spreading their seed to the four winds, while their betters, who have other priorities, or other more worthwhile contributions to make to society, have their genes gradually snuffed out over the course of generations? (Herbert Spencer, The Study of Sociology (9th edition). London: Williams and Norgate, 1880, p. 400). In other words, by allowing the transgenerational proliferation of Morlocks, we ensure the future misery and ultimate extinction of the favoured Eloi. Of course, in the eugenic universe, it is almost always left unexplained how it is that supposedly degenerate and “inferior” Morlocks are always threatening to outbreed and swamp the “superior” Eloi. After all, in the natural kingdom ruled by natural selection, “superiority” is cashed out in terms of reproductive success. Reproductive success is the only good coin in the evolutionary realm, and by this standard, it is the Morlocks who are clearly superior and the Eloi inferior. In any case, Spencer’s is an interesting recasting of typical 19th-century laissez-faire arguments against welfare schemes to help the poor. The typical argument holds that the poor are undeserving of such help, because they are somehow morally undeserving, or because it would be pointless to help them, as they are essentially inferior and can never be improved, and/or that it would be economically inefficient to do so. Instead, Spencer characterizes welfare redistribution as an instance of intergenerational injustice: by helping the poor, we are enabling them to breed in greater numbers, at the expense of our morally healthy and more deserving descendants. There are of course at least a couple of glaring flaws in Spencer’s reasoning. First, he hasn’t shown that the qualities that make for moral superiority are genetically heritable. Notice that in the slippery wordplay of the Social Darwinists, there is constant equivocation between the descriptive language of physical and genetic inferiority, and the normative language of moral inferiority. Hence Spencer’s “aiding the bad in multiplying” could mean aiding the genetically defective, or it could mean aiding the morally defective. Genetic defects are heritable; moral defects are not obviously so, or not in the same way. Second, Spencer assumes that policies that will alleviate the lot of the supposedly inferior will also cause them to have more children. Again, the evidence for this claim is lacking. True, other things being equal, in the natural world the longer a creature lives the more offspring it is statistically likely to produce. But among humans, who are capable of procreative choice, a different dynamic may apply. There is some empirical support for this, since development economists will tell you that raising the living standards of the poor tends to reduce their fertility rates rather than raise them, at least in the longer run, perhaps by giving them options for living a meaningful life beyond the mere production of offspring. Of course, in reply to this latter point, it is enough for Spencer’s argument if the inferior are enabled to have any offspring as a result of such policies. Welfare needn’t increase their birthrate; that they have any children at all is an evil to be avoided. 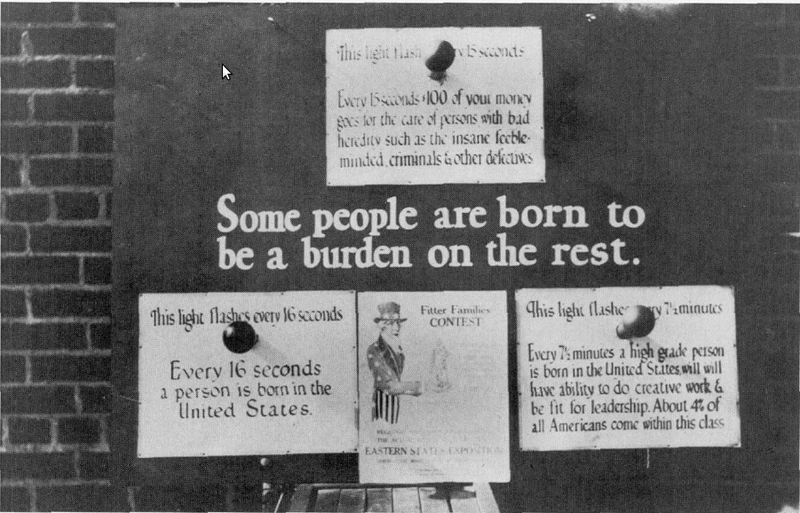 If the inferior have a birthrate no higher than that of their superiors, say two children per female, but welfare enables them to live long enough to have those two children when they would otherwise die without reproducing, then Spencer could argue that welfare would be socially mischievous. There would exist two more inferiors than should by rights exist, to compete against our healthy descendants for resources. Such is the brutal and inexorable logic of Social Darwinism. I truly wish that people like that little rat-man on the subway didn’t exist. But sterilizing such vermin wouldn’t solve the problem, because his failing is moral, not genetic. We could sterilize him, but once he had healed from his surgery, he would be back on the subway, pushing pregnant women around. Meanwhile, other genetically “healthy” people would still be passing their bad morals on to their offspring. You see, bad morals can be passed on from parent to child much as bad genes can be; but bad morals don’t reliably track bad genes, nor do they reliably track lack of wealth. This is another of Spencer’s mistakes, for whenever he uses the royal “we” (e.g. “maliciously providing for our descendants a multitude of enemies”), he seems to imply those who are affluent or at least solidly middle-class; in effect, he speaks to those who were capable at the time of buying and reading his books, and who were more likely to believe in their contents. To these people it must have been flattering to be counted among the “healthy” or “superior” types. But, Victorian assumptions aside, being solidly middle or upper class is not equivalent to either genetic or moral superiority. The fact is, the rich are just as capable as the poor of moral inferiority. The main difference is that the rich have material advantages that deflect many of the worst consequences of their vices. The poor are not so lucky — their vices tend to stick. Vices that cause fits of unhappiness or, at worst, depression in the rich, may be utterly life-destroying for the poor. Vice is a luxury the rich can often afford and the poor cannot. The rich substance abuser can pay for a bed in a private rehabilitation clinic. The poor substance abuser will find his bed in a prison or eventually in the gutter. The difference in the two cases is one of circumstance, not of the moral quality of the abuser. Similarly, when the rich neglect their children, they often do so with the aid of nannies and boarding schools. Since the poor cannot afford nannies and boarding schools, poor parents who neglect their children may be thrown in jail and are likely to have their children taken away from them. Actually, if we must compare the two kinds of viciousness, we might go so far as to say that the viciousness of the rich is worse. Since the rich are less often exposed to the full consequences of their bad behavior, they grow confirmed in their bad habits, less likely to learn from experience they never acquire, and — what’s worse — they encourage such bad behavior in the poor by their seemingly glamorous and consequence-free example. We cannot discuss sterilizing the morally inferior until we get better at identifying them. As a society we are very good at identifying a subset of the morally inferior — namely those who are poor. These tend to be visible, which is why it was so easy for Spencer and his ilk to see them. He was less good at identifying the ones that were sitting in the House of Commons or the boardrooms of the nation. Once we have developed better methods for identifying moral degeneracy, we must not shrink from calling it what it is. We must get better at denouncing the morally degenerate. The ability to feel shame was given to us for a reason. Shame is a great teacher; the morally inferior ought to be made to feel it more often. In an ideal world, each of us would be equipped with a chip embedded inside us, along with some kind of transmitter with a button (perhaps it could come in the form of a phone app?). The latter would be used to administer a small but painful electrical shock to people like the rat-man, who violate those small social norms that the criminal law does not concern itself with. The purpose of the embedded chip would be to receive these electrical shocks from others. In such an ideal world, the rat-man would have received separate shocks from all those on the train who observed his sub-human behaviour. I’m sure it would be a lesson he would not soon forget. And the anticipation of such unpleasant sensations would tend to keep us more aware of the effects of our actions on others. We would have a very concrete incentive not to be the source of displeasure. If everybody came thus equipped, perhaps we could eliminate the most common forms of incivility in fairly short order. And since I believe practice of the smaller virtues conditions us for the exercise of the greater ones, I can’t help but think we might end up with a better society. It would certainly be a more amusing one.